New season means new colors! A new coat of paint on the wall can make a world of difference. Only choosing the right color is still rather difficult. Below tips will help you. A nice pattern or stripes do a lot with a room. This way you can brighten up a room or make it more playful. If you are going for a busy pattern or multiple colors, limit yourself to one wall. This way you do not get too busy. Horizontal stripes make the room appear longer. Vertical stripes, on the other hand, make a room appear somewhat smaller. The color of paint can do a lot with the space. This way you can make a space cozier or more spatial. If you paint a wall with a darker color then the space looks narrower. If you paint the ceiling dark, the room will appear lower. This can give a nice intimate effect. Do not you want this? Then paint the ceiling lighter this creates height. Make the total room look bigger? Then paint the walls and the ceiling in the same light color. Each color creates a different effect: cozy, light, spacious or calm. You need to decide in advance. • White: spatial, clear and fresh. The light also reflects well on white, which ensures clarity. • Gray: calm and spaciousness. Gray also strengthens depth. • Red: passion, warmth but also aggression. Red is a very striking color so make sure you do not paint too large a surface of red. • Blue: cool, calm and calm. Blue works well in a room where a lot of sun and warm daylight comes in. Be sure whether the color fits the interior? Then you can best try the color around a small piece of wall. Specialist has found something super handy on this: the color tester. That is a small paint roller with which you can apply about one square meter of paint. And it is done that way. 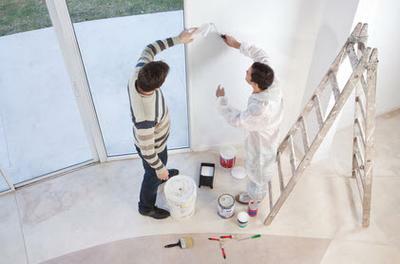 Apply two coats of paint and assess the color after wearing in daylight and artificial light. This way you can see exactly how the color is. That way wall paint is a lot easier! 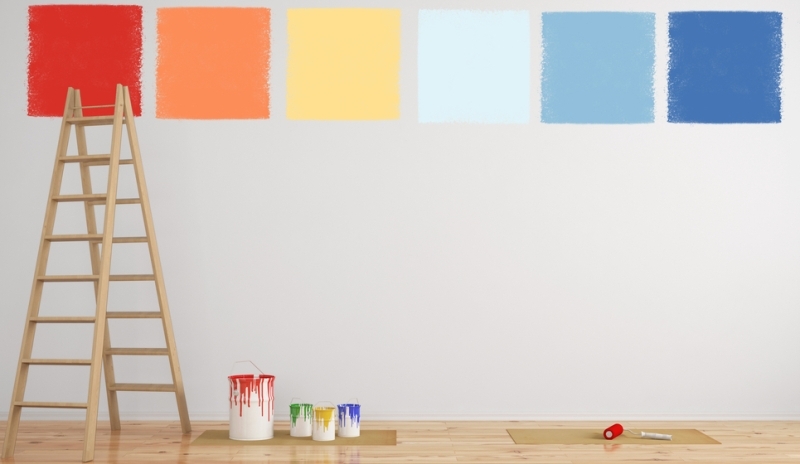 Planning to give the walls of your bedroom a new coat of paint? Even before you take that paint brush, the most difficult job is to choose the color. Luckily, there are many color specialist and they knows everything about how colors affect our mood. She explains why you prefer not to choose purple in the bedroom, and why blue is a good idea for the kitchen. Not insignificant if you want to relax in the bedroom, while an office space has to ensure concentration. These are tips for the most important rooms in your house. Blue is a color that we universally associate with tranquility and tranquility, which evolutionarily can have to do with a blue sky or water surfaces. Studies have already shown that your bedroom blue painting can improve your night’s sleep. Choose a light, bright blue color rather than deep blue tones. Avoid: purple. The color may be in blue, but for a refreshing night’s sleep it is not a good choice. Green is associated with creative thinking and mentally prepares you to take action. That could be due to the fact that nature is reminiscent of nature, so that you can clear your head. Choose again for soft green shades, possibly gray-green, because you do not want to be over stimulated. Avoid: red. Do you remember those big red circles that teachers made on your tests at school? Believe it or not, we unconsciously take that association to adult life. Red colors can cause us to perform less. The kitchen is slightly more nuanced, because it depends on what effect you want. Warm, saturated tones such as reds and orange arouse appetite. But if you try to eat a little less, blue has the opposite effect. In any case, striking, saturated colors in the kitchen are okay. A touch of energy in the kitchen is welcome if you have to make breakfast on Monday morning. Avoid: yellow or green shades. Curiously, yellow is the most hated color worldwide, but is often used in kitchens. If you combine yellow with green shades, it evokes the association with nausea – which you absolutely want to avoid in the kitchen. White is associated with beauty and purity, but it can also make a room too tight. Pink, on the other hand, is the most flattering for every skin type, and can even give you the feeling that you are slightly warmer when you step out of the shower. Choose subtle soft pink, which also gives a modern look. Avoid: bright neon colors. The living room is a multifunctional place where you can both read a book and catch up with friends. The trick is therefore to find the middle between colors that give energy, but at the same time are soothing. Warm tones such as sand, light beige or off-white are therefore good to keep cozy. Avoid: too dark or striking colors. It is perhaps one of the most difficult decisions when decorating your home: with the mentioned tips you can easily determine the right color for your wall. Your taste is of course very important, but the shape and function of the room can also be very decisive for the color of your wall.